Hair stylist extraordinaire Laurent Dufourg has been been working his styling magic on Hollywood celebrities since he was 16, and with over 45 years experience knows a thing or two about hair and hair products with the creation of a range of cleansing, conditioning, intensive treatment and styling formulas known as Privé. With his list of loyal followers reading like Hollywood's latest blockbuster hit, you know it's gotta be a great product to get the ringing endorsement from the likes of Brad Pitt, Angelina Jolie, Uma Thurman, Gwyneth Paltrow, Selma Hayak and Debra Messing. So it's exciting times when his cult haircare brand Privé launched into the Austral market in June this year along with its latest eco-friendly line Concept Vert. Privé products nobly aims to minimise the impact on the environment by reducing the need to use large amounts of the products in each application through making concentrate products that contains no sulphates, gluten, phthalates, DEA, TEA, mineral orils, paraffin, PABA, parabens, and artificial colours so it does less harm to our skin and our waterways. With such high praises my expectation on Privé was raised up to the stratosphere. Did it measure up? Lets take a look. Colour safe formulas means no fear of premature fading of my new hair colour, sure enough when I rinse, the water is clear so there wasn't no leaking of colour during the wash.
Has an OMG to die for herbal scent. It's a very refreshing natural fragrance, unlike many 'natural' scents in other hair products, it really liven up my senses in the shower. Love the rich lather the shampoo gives, it is very rich and luxurious feeling, and a little does indeed go a long way and I didn't have to double shampoo as I usually do with other products. The shampoo is very moisturising with orchid extract to rejuvenate dry damaged hair and aloe and glycerin to revitalise and close the cuticle of the hair shaft to encourage hydration throughout the day. The conditioner contains the same beautiful soft herbal scent and is richly conditioning with rose hip oil to protect from UV rays and ginseng extract to improve hairs elasticity and appearance. It works as well as a treatment mask to hydrate and control minor hair damages. Hair feels silky and de-tangled and soft and feels smooth afterwards. It's also easier to manage and style as my stubborn ends that normal like to stick out in all directions are very well behaved. Also noticed a slight increase in volume and body and hair does have that extra bounce. 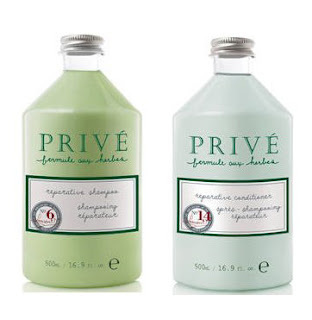 The Privé Reparative range is heavenly to use and unfortunately comes with an eye watering price tag to boot. So is it reallhy worth the extra costs? I'd say yes for an indulgent treat before a big event or if you want to feel like a Hollywood star, as you'll surely be on your way to having beautiful and glamorously healthy hair. It will be part of my daily hair care routine only if I make the kind of money that Brad Pitt makes in a movie or manage to win tomorrow's lotto. Would you pay top dollar for your shampoo and conditioner if it delivers? Shampoo RRP A$37.95 | Conditioner RRP A$49.95 at selected salons and in David Jones stores. For stocklists call 02 9695 7878. More information on Privé can be found on its website here. @msmadamakeup - google Laurent Dufourg. I've seen him a couple of times on E! and other celeb back stage segments. His haircare line just launched in Australia and is definitely worthy of celebrity status.